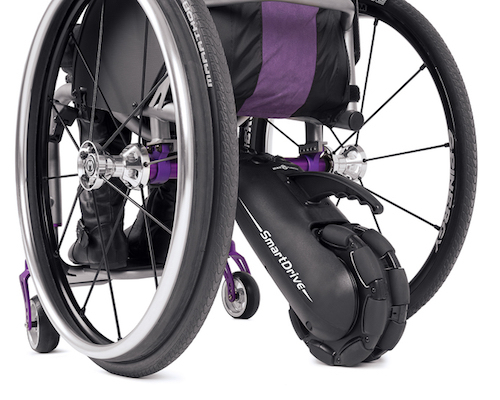 SmartDrive MX2+ by max mobility helps you power up steep hills and through thick carpet. It’s intuitive to use and will go for miles on a single charge. With the MX2+ simply double-tap to start ramping up the speed, tap to coast at your current speed and then double-tap brake to stop. The SmartDrive MX2+ is surprisingly powerful and includes an anti-rollback feature that allows you to stop on a hill and then easily get going again. It is lightweight and easy to install; the system weighs only 5.8 kg and simply attaches on the back of the chair. The new SmartDrive MX2+ now includes the PushTracker wristband, providing information and individualisation for your SmartDrive. With the PushTracker Activity Monitor and its FREE Smartphone App, you can control your SmartDrive and track day-to-day propulsion metrics—including push count, coast time and more.